Many of the animals you’ve seen in movies have been supplied by Gary Oliver. The animals come from Cinemazoo, Gary’s home for exotic pets of all kinds, from 10 inch millipedes to snapping turtles and alligators. On set, Gary is their wrangler: he makes them do what they’re supposed to do. But, he is also their protector. Virtually all of his animals have been rescued, and he has taken on a mission to help others, especially young people, learn about responsible ownership and species preservation. Gary has gone through many doors in pursuit of his dream. It’s been a long journey to get here, and it’s not over yet. 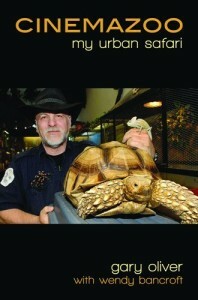 This book follows his adventures (and misadventures) on the road to Cinemazoo.